Four generations have passed since the giants of old, the Nephilim, returned to dominate the world with an iron fist. After unleashing a devastating plague, these sons of the fallen angels have enslaved mankind to satiate their lust for power, gluttony and sexual avarice. Yet hidden among the rubble and decay of a vanquished civilization are scattered bands of survivors, raiders, who press their fight for freedom and the ultimate annihilation of the race of giants who once again threaten to lay waste to the earth. Nora is a tall and beautiful young woman whose skills in guerrilla combat have earned her a position as leader of a small team of raiders. 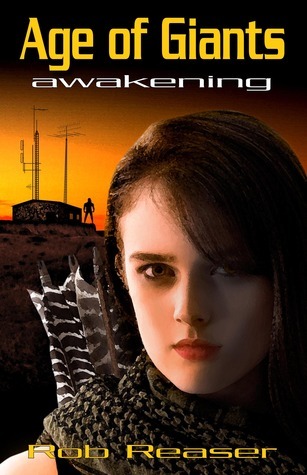 While away on a mission to destroy an outlying Nephilim communications post in old New Mexico, Nora’s clan is nearly wiped out in a Nephilim attack. The survivors, including Nora’s father, are taken for slave labor deep inside the Kralen Dominion. Nora sets out to rescue her father, but along the way she’s held captive by a secretive resistance group, and uncovers a dark secret that puts her in the center of the war against the brutal giant overlords. World Building: Dystopian vibe, human race threatened with extinction pretty much. An interesting concept with the Nephilim, though it’s one of those angel-related themes that I’m not that crazy for. Characters: Very active, they’re constantly struggling and fighting and such. They didn’t reach me much, I wasn’t invested in any of them though if any of them had more of a chance to catch my heart it would have been Nora. Plot: Dynamic, a lot of action. It’s an adventure/journey scenario and if you’re into guns blazing and constantly fighting for your life and the lives of those around you, then is definitely a read for you. Writing: It’s a third person narrative with fantasy-vibe style with lots of action, though I didn’t respond to it much it was well done. Curb Appeal: Not so hot for me since it’s not a scenario I respond to, but the cover gives the vibe of the read and the blurb is a good teaser for the story. All in all it’s an interesting read if you like alert action and fighting and such.